ACTION ALERT: An Open, Public Inquiry Into Veronica Baxter�s Death NOW !! Our current Prime Minister Kevin Rudd, made a public apology to the Aboriginal people, but how much change has really taken place? 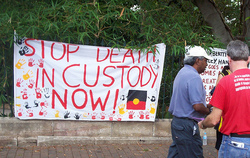 Aboriginal deaths in custody, commonly referred to as Black deaths in custody, are on ongoing problem for our country. The recent case of T.J. Hickey who also died in custody, caused major uproar and recieved some international attention even, but yet the government refuses to teach this issue seriously and yet again another death has occured. An Aboriginal trans-woman, Ms Baxter was placed in an all male, maximum security jail and was found hung in her cell on March 16th 2009, only six days after her arrival. She is another black death in custody. Over a year later, no Coroner's Report has yet revealed the cause of death. We call on the NSW Government to conduct a full, open inquiry into Ms Baxter's death. To have Ms Baxter, as a Tran-woman, placed in an all male maximum security jail, is a grave misjudgement on its own. To then have her die within six days is absolutely questionable, and deserves investigation. This is an injustice effecting not only the Indigenous community, but the LGBTI community aswell. The Corrective Services Minister of the time, John Robertson, was questioned as to the investigation into her death, and gave us no information, and to this day we still don't know whats happened, and the government have remained unaccountable. So now we call on the new minister, The Hon. Phillip Costa MP, to conduct a full enquiry, and provide Ms Baxters family with some closure, and show that this government is accountable for what happens in its jurisdiction. Thankyou for joining us to the send the message to the government that every black death in custody is unacceptable. Signed the petition and noted. Thanks Simone. signed, This has been going on far too long and the Government needs to take a look and take action to stop this happening to these people. Questions need to be answered why was she put in a male cell, aboriginal people cannot be confined into a small cell so why do they keep doing this over and over. I can't help but wonder, though, where are all of the Australians on care2 who are so quick to attack the US and Israel for human rights violations. Here's a chance for them to make a difference in their own country and they are noticeably absent.